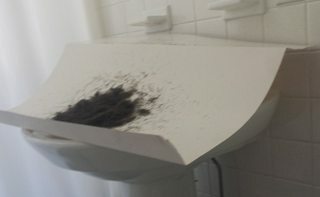 How does one efficiently clean-up hair from sink and counter area after shaving or trimming beard? After shaving, but more so trimming my beard (using electric trimmer), mustache, or trimming my hair a bit their is inevitably leftover hair to be cleaned up after the fact despite best efforts to contain the mess, such as crouching down over the sink and other methods I am intentionally not listing. The clean-up process can end up taking longer than the actual grooming. I would like to find a more efficient way to clean it up so I do not leave little hairs pieces remaining nor it take longer than shaving/trimming. Taking into account I know hair is more stubborn around any residue (soap, toothpaste, etc) , calking, and angles to easily be cleaned up. Hot vs. Cold water doesn't seem to make a difference as far as getting the hair to bunch or attach to rag. Vacuuming is not a practical option, nor did using a dust buster hand vac the one time I tried it both to noise, convenience, and some hair will be wet. I really want to focus the answers on the cleaning aspect, not prevention. I did not list every prevention I do or try method on purpose and some of them being listed will will simply transfer the problem that would again create cleaning problems. So focus on the 'cleaning' aspect please. I use an electric beard trimmer so I end up shaving over the sink as well. I line the sink with 2-3 paper towels(try to cover the whole surface area of the sink) and wet them. I shave over the sink as best I can although hairs inevitably get elsewhere. After I'm done I throw away the paper towels(along with most of the hair), and then take a wet paper towel and wipe away any remaining hairs. I'd guess the cleaning takes about 3 minutes and it's clean enough my girlfriend doesn't seem to notice or complain. This is just a guess since I am a female and don't shave my face, but I think it'd work if you put a towel in the sink before you shave, just lay it out on the surface and then shave, the hair will fall on the towel and you can still use the tap. Afterwards you can just fold the towel and put it in the laundry. I have a piece of poster board that I cover my sink with. I have folded the board to rest easy on the faucet, as well as stop any hair from sliding off the paper. The hair is still dry, so it slides right into the trash when I'm done ( or I put it outside for birdies to make nests out of ). There are always a few hairs that manage to get on the sink, but I wash them down, as I feel it is less hair than one who shaves everyday would wash down. I've been using the same piece of poster board for about ten years now. The length side split approximately half way down. Place it in the sink and all your trimmings fall into the open bag. When you're done you simply lift the bag and give it a jiggle on an angle and all the trimmings fall into the bottom corner. The small trimmings form a nice neat ball which rolls out of the bag and into the garbage. Keep the bag for next time! No need to waste water, clog your pipes and make a mess with towels and the like! You can use your moist hand to wipe up the loose hairs around the basin. Wash once after, done. Advanced topic: aim for a spiral path for the splashes so they hit more sink surface before returning to the hole in the middle. Try using the razor in the bath tube or in a shower. Afterwards you can rinse the whole tub easier using the hose. You can put one of these cosmetic mirrors with a suction cup on the wall if you need a mirror. Also, if you use the trimmer on wet hair, it will stick together and it won't fly everywhere. You will unfortunately have more work to clean the trimmer. I have been cutting my own hair for twenty years, shaving for that long as well, using electric clippers. This is a problem the first few times you perform this task, but it is something where "practice makes perfect". For cutting my hair, I use a plastic bag from the grocery store which fits almost perfectly into the bowl shape of most sinks, and then I shave my head above this plastic bag. For facial hair, I use the same Wahl brand clippers (absolutely the best brand by far) to trim my beard to stubble once every couple of weeks. I can see how a more significant beard would create a situation where you would plug the sink up while trying to wash the hairs down, so for this, I would go with the same plastic bag method. Otherwise, I simply shave with the clippers over the bare sink, and wash down any hair in the sink afterwards. I use a small amount of wet toilet paper to wipe up any stray hairs that inevitably end up outside of the sink itself. Wet is the key word here: It causes the stray hairs to stick to the toilet paper like a magnet, vastly increasing your cleaning efficiency. Like I said, after a few messy experiences using this method (and frankly any and all other methods except perhaps one of those old school FlowBees), you'll get the hang of not making your wife/girlfriend angry when you perform maintenance. Good luck! If the sink is completely dry beforehand, the dry hairs from your mustache & beard shouldn't stick, and a vacuum with a hose (and possibly a brush attachment) should work very effectively. I shave with clippers every other week or so and it gets everywhere around the sink. What I use to clean the sink and surrounding counter area is a bit unique; you know how in a pack of, say, NyQuil capsules, there's an "empty" square in the middle? Save this piece and use it as a scraper to scrape everything into your sink. If stuff is sticking to the sink wall, this piece should be stiff enough to scrape it out. When you're done, just rinse it off and throw it back in your drawer. Filling the sink halfway before doing your routine will prevent everything sticking so hard. Any thing left can be swilled with the glass you use when brushing your teeth. I can understand your desire to focus on cleanup and not prevention! When I trim my beard I use a large round plastic bucket with a rope handle that completely covers not only the sink but a few inches (5 cm) on either side, and I still find hairs in the sink afterwards which must be cleaned up. It sounds like the solutions you have tried involve getting the hairs out of the sink and surrounding areas. My solution is just the opposite - I simply wash the hairs down the drain. They are very short and not long enough to stick together and clog up the drain, and it is much quicker and cleaner than trying to keep them out of the drain. If you have a lot of hair in the sink you might be more reluctant about using this method, but it does work quite well if it's only a little hair. It's not clear whether you're using something electrical which uses the power socket in the bathroom. If not, don't do it over the sink - obviously, wet shaving must be done at the sink, but any trimming can be done elsewhere. Put a towel across your lap and sit at a table with a mirror - that means you can use a dustpan and brush to clear the table and take the towel outside and shake it out. Being female, I manage leg hair standing on a towel (if you're using an epilator, where the hair falls to the nearest flat surface) and shaking that out afterwards. Underarms, I use the electric shaver with a mirror placed behind the loo - I lift the loo seat, look in the mirror and use the shaver, and all the bits drop down the loo, and I just flush it, job done. If I didn't have a shelf behind the loo, I'd use the towel across the lap sitting at a table method instead. Not the answer you're looking for? Browse other questions tagged cleaning bathroom shaving or ask your own question. What to do if your shaver broke halfway through shaving? What is the least painful and most effective way to keep chest shaved? How to stop water from dripping on the sink counter and bathroom floor when washing hands? How to build a very close shaving shaver? How does one efficiently clean-up loose hair strands from one's back after washing hair in the shower? Is there a gadget designed to help with this? How to remove leftover double-tape and sellotape marks after Christmas?